The versatile Spectra Precision Laser CR600 Magnetic Receiver is designed for use by general, concrete and site prep contractors. 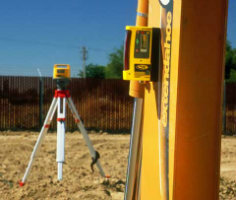 It is an easy to use tool for accurate measurement of elevations across the site. The CR600 can withstand harshest conditions on the construction site. It has a rugged, waterproof, lightweight magnesium housing capable of withstanding a drop of up to 3m (10-foot) on concrete. The CR600 can be used as a hand-held or rod mounted receiver for a wide range of applications, including measuring cut and fill, leveling forms and footers, setting grade and measuring elevation changes. In addition, the CR600 can be used as a machine control mounted receiver for use on a backhoe, small excavator or skid steer loader. The CR600 is an ideal low-cost entry to machine control productivity. With its 15-channel linear display, it does not require the operator to be ‘on-grade' to measure, as the high and low indicators allow the offset to the on-grade position to be directly measured. Moving outside of the receiver pickup area, the lost beam direction indication allows contractors to quickly recover the on grade position. The CR600 is visible across the jobsite. The super-bright red and green LED elevation indicators ensure high visibility in poor light, at a distance and at an angle. Wraparound receiver cells with continuous pick-up through an operating range of 270° mean less setups and improved productivity, especially for machine applications.